Creeping Winter Savory (satureja repandra) - Rare and hard to find savory variety has a low growing creeping habit perfect for rock gardens, etc. Makes a very beautiful container plant. 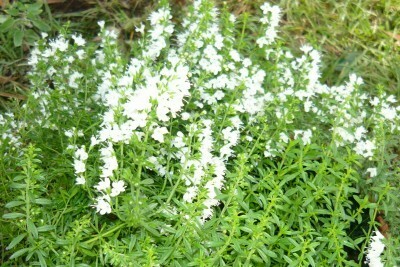 Masses of white flowers when in bloom. Nice savory flavor for culinary use. Perennial zones 7-8. Live starter plant shipped in 3 inch container. Needs a well drained, hot area to return in the spring. Love this plant!